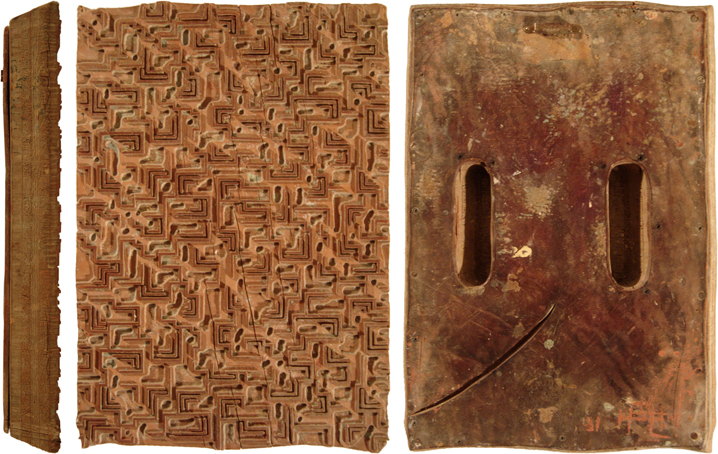 CM: This hand-carved wooden print block, also known as cap or tjap, is used to adorn traditional fabrics using both the lost wax process of dying and direct dying. This block is a vintage used piece. It shows wear, including minor damage to the printing surface, such as chips and cracks. Holes drilled into the block allows air and excess ink to escape. Each block is often carved to be only a part of the whole picture - thus designs may not be complete with a single stamp. For example, one stamp will print the flower stalks and leaves, while another print block prints the flower petals and yet another print block the details of the stamens, etc.